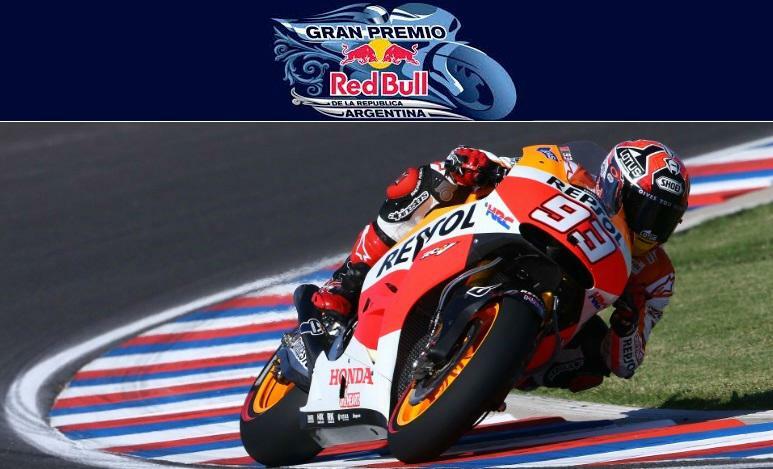 MotoGP 2017 season get into full flow with the second grand prix of the season which will take place this weekend from Friday, 07 April to Sunday, 09 April 2017 at the Autódromo Termas de Río Hondo. Marc Marquez won the race last year but this season has started with some pretty unpredictable results with Maverick VIÑALES winning the first grand prix in Qatar. The coverage of this weekend starts with Friday practice sessions at around 09:40 am local argentina time / 13:30 uk time. MotoGP Argentina Preview: The weekend start with traditional friday’s practice sessions unlike the Qatar GP where riders had three days of practice under their belt before the actual race began. Argentina will be a true test of “Michelin tyres” who replaced Bridgstone as MotoGP tyre suppliers for this season. Lorenzo will have to ride out of his skin to get the first place on the podium which will be his first in Argentina as he finished 4th and 5th respectively in last two years. Valentino Rossi won Argentina GP last year having started from 8th place on the grid while Marc Marquez won won back in 2014 will be favorite to go all the way and claim his second win in Argentina. 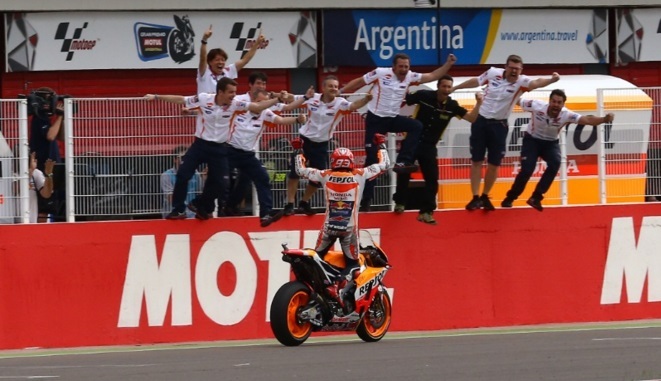 Marc Marquez won the 2016 Argentina grand prix having dominated the motogp weekend from start to finish. Valentino Rossi finished second behind Marquez while Dani PEDROSA made it to the top 3 on the grid. 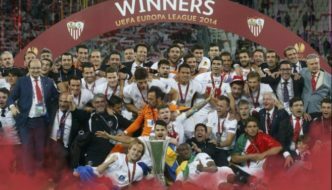 Jorge Lorenzo failed to finish the race. The biggest surprise of the weekend was Eugene LAVERTY who finished just outside the top 3 while Hector BARBERA also managed to get a respectable 5th place. Pol ESPARGARO, Stefan BRADL and Bradley SMITH finished 6th, 7th and 8th respectively. 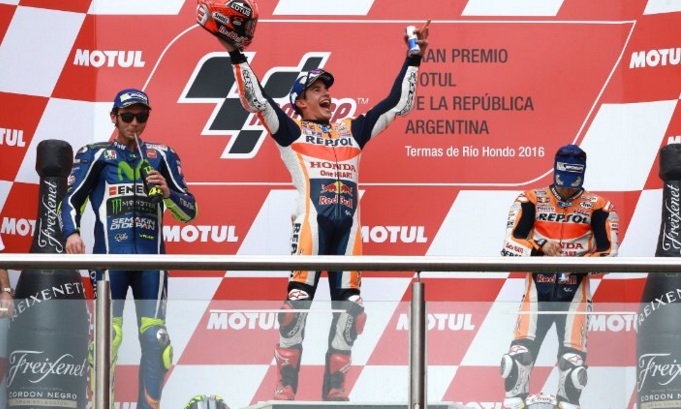 Below are the official Argentina motogp race results as Marc Marquez wins his first grand prix of the season while renewing his rivalry with Valentino Rossi. Jorge Lorenzo had a crash and failed to finish the race leaving title race wide open. Argentina MotoGP Qualifying: Marc Marquez was at his best throughout the weekend starting with the practices sessions where he set the pace and also managed to take the pole position ahead of the Sundays race. Lorenzo finished third behind Marquez and Valentino Rossi. 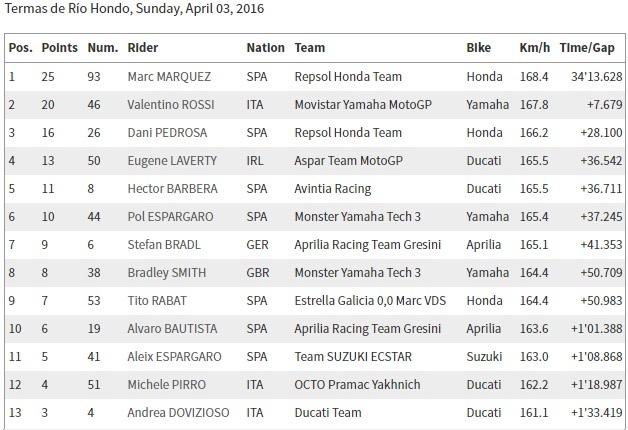 Dani Pedrosa and Andrea Dovizioso took the the 4th and 5th positions on the grid. Argentian Grand Prix is hampered with weather conditions and how the race pan out is pretty much unknown for both riders and teams.